All of our furniture casters are tested to BIFMA standards. CasterWeb.com has been helping its customers for years by satisfying all of their needs for furniture casters and industrial casters. 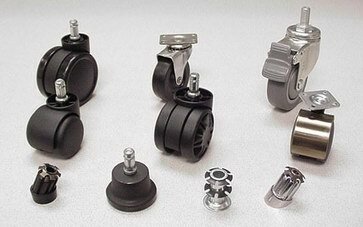 Whether it is casters, bell glides or caster sockets, CasterWeb.com provides unparalleled customer service and supply chain management. We have helped many of our customers in the office furniture industry, medical equipment industry and beyond decrease their purchasing costs and reduce their inventories of casters and many other components which translates directly into real cost savings. Call or us today to find out why so many companies choose CasterWeb.com as their single source for all of their furniture hardware needs.